To all the girls out there, this entry is for you! To all the guys our there, this is a perfect gift for your loved ones! Posh Pocket Shoes is your solution to tired feet that was in heels or in super enclosed shoes like rubber shoes the entire day. You don't have to worry on how to carry your pair of Posh Pocket Shoes. POSH (PO-cket SH-oes) are foldable, rollable, portable yet chic ballet flats that fit in your purse! So you change from your killer heels to your Posh Pocket Shoes, anytime and anywhere! Not only are they handy, they're fashionable and comfy as well. So, how is it that you change into your Posh Pocket Shoes anytime and anywhere? It's because all Poshies come with a mini purse to store your POSHies while not in use. 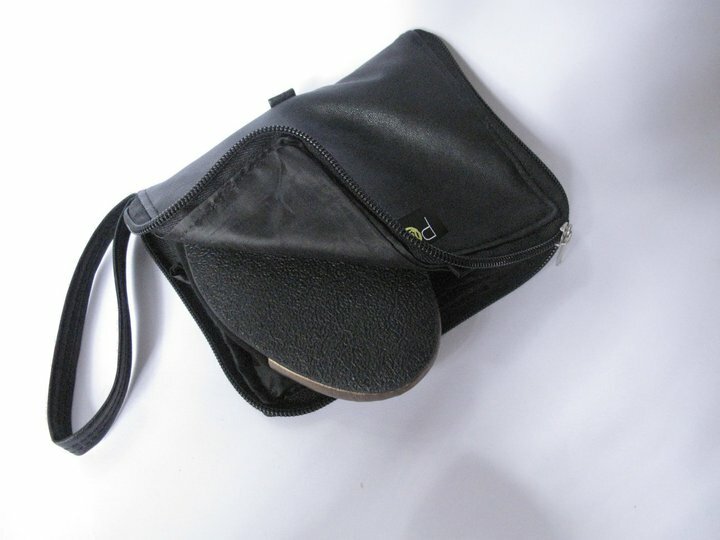 This mini purse transforms into a tote bag where you can stash your heels after changing into your Posh Pocket Shoes. With Poshies, you don't need to worry anymore about tired feet after wearing heels all day or you don't need to worry about going back to your car to change into a more comfortable shoes. I also have to say that personally, I think this idea is better than carrying or having slippers as your back-up pair. Since Poshies are stylish, you don't have to worry about ruining your entire outfit. Whether you're in corporate attire, cocktail dress, or smart casual, your Posh Pocket Shoes will fit your ensemble. The mini purse that comes with your Poshies is an effective way of having your back-up pair within your reach all the time. I wish I could include in this post a picture of myself wearing my own Posh Pocket Shoes. But I just recently ordered my favorite pair. I'm actually really excited to get it. 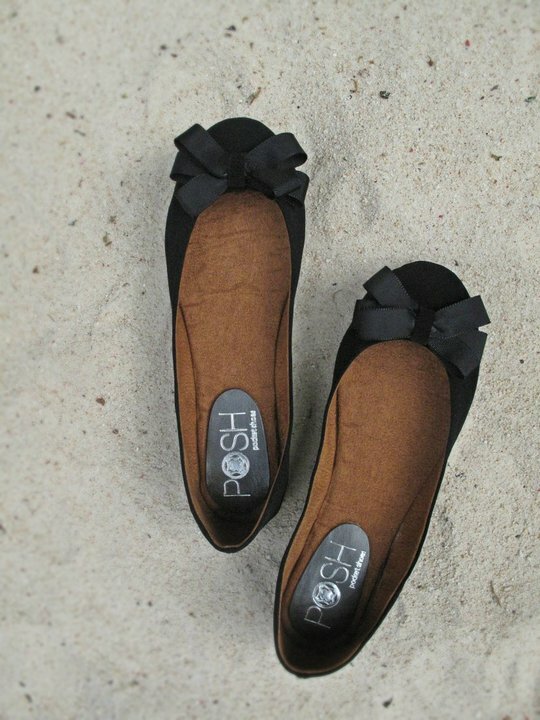 This is my favorite Posh Pocket Shoes -- the Black Bow. I simply love this pair because it is versatile, both in color and in design. I can match it with almost any outfit. It will go well with casual or with a dress. I actually ordered this and hopefully I'll get it in time for the Super Sale Bazaar happening in Rockwell Tent from July 31 to August 01, 2010. 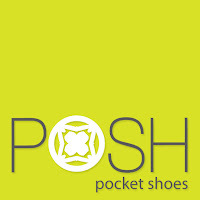 Posh Pocket Shoes will be participating and they're offering a 10% discount to any customer who's wearing her Poshies! The bazaar will be from 10am to 9pm. I suggest you go there during the first day so that you'll have more choices and more sizes will be available. 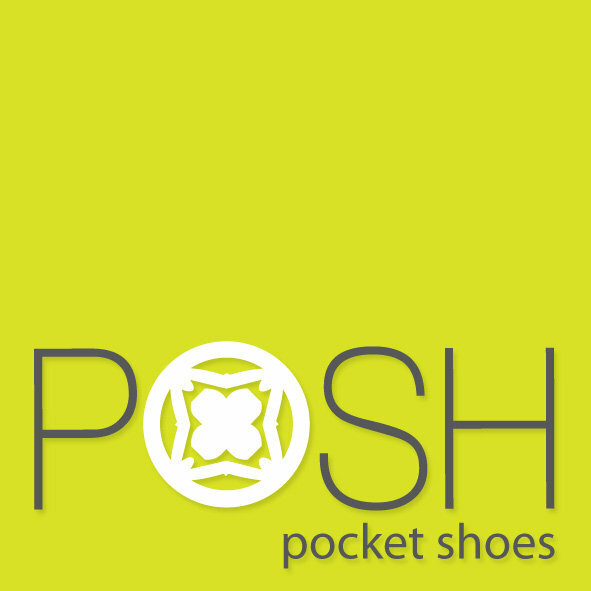 Posh Pocket Shoes will be at Booth B3. Upon entering Rockwell Tent, they will be at the 1st aisle on your left, towards the back. 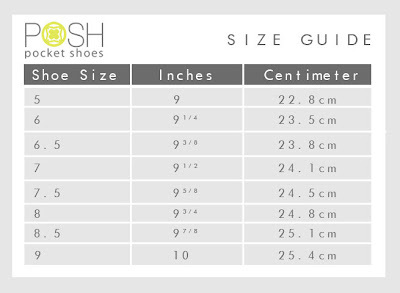 What's more, Posh Pocket Shoes makes it easy for you to determine your shoe size by providing buyers with a size guide that comes in inches and centimeters. No more guessing what size you'll order! This is definitely a plus because you really don't want the hassle if the shoes you ordered will not fit you. POSHies are not your average kind of foldable shoes. They are made of a leather-like material and designed with a double-sole for added cushioning and comfort. POSHies offer more style and protection than any emergency flat shoes made of thin fabric. Oh and you have to know that we’ve perfected the shape of this shoe to be the most flattering on feet, just by the lovely low cut and the perfectly round toe. Posh Pocket Shoes are also Eco-friendly! POSHies are not for disposable use and are meant to be used over and over again. When you are done using your POSHies just fold them up and put them back in the mini pouch. The re-usable pouch is smarter than your old fashioned shoebox. Shoeboxes account for millions of tons of waste, that’s why our packaging takes up less space than boxes and also weighs less when shipping. 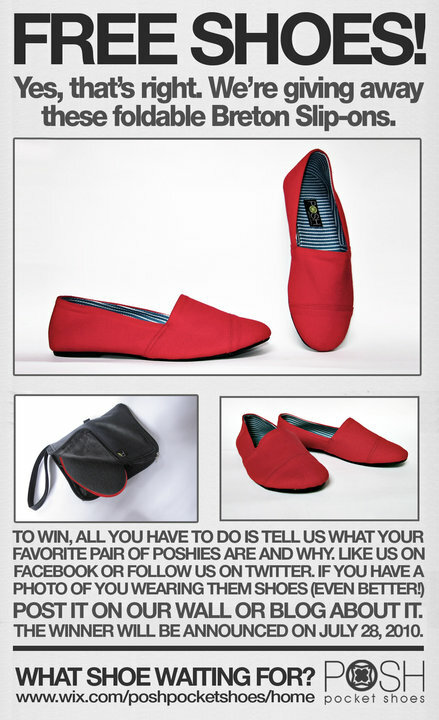 Posh Pocket Shoes is holding a contest that will give girls a chance to win a pair of red (RED!!! My favorite color!) foldable Breton slip-ons! Just share what's your favorite pair of Poshies and why in their Facebook wall. 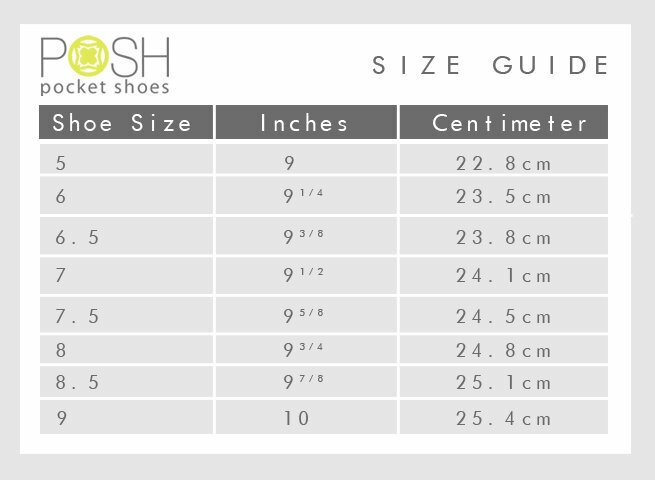 View a complete catalogue at Posh Pocket Shoes and order your pair of Poshies now! You can also visit their Facebook Fanpage or follow through Twitter. P.S. While I was composing this post, I received an email confirming my Posh Pocket Shoes ... Black Bow (YES!) order! I'm excited! I'm supposed to get it anytime soon! Will devote a separate entry for it, hopefully with decent pictures of me wearing my very own poshies! dear san pa available ito?